Blatantly lying for the president was fine. Working for Anthony Scaramucci is not. WASHINGTON ― White House press secretary Sean Spicer resigned his position on Friday after the communications director job he wanted was given to Anthony Scaramucci, the self-promoting hedge fund cable news talker. This was the line in the sand for Spicer ― not the near-daily humiliations he allowed himself to be subjected to in defending his boss, President Donald Trump. Spicer’s infamous turn as press secretary began with perhaps the most obvious lie ever told in the West Wing briefing room. On the first full day of Trump’s presidency, Spicer marched out to the lectern in an ill-fitting suit and insisted that the president’s inauguration featured the largest crowd in presidential inauguration history. Photographs and Metro ridership figures clearly showed that Trump’s inauguration was not the largest ever. “That was the largest audience to witness an inauguration, period,” Spicer declared to an endless parade of Pinocchios and “pants on fire” ratings from fact-checkers, and mocking memes from everyone else. Spicer’s humiliating display of wanton mendacity made him instantly famous ― and not in a good way. But Spicer did not quit then. The line in the sand came six months later with Scaramucci’s hiring. 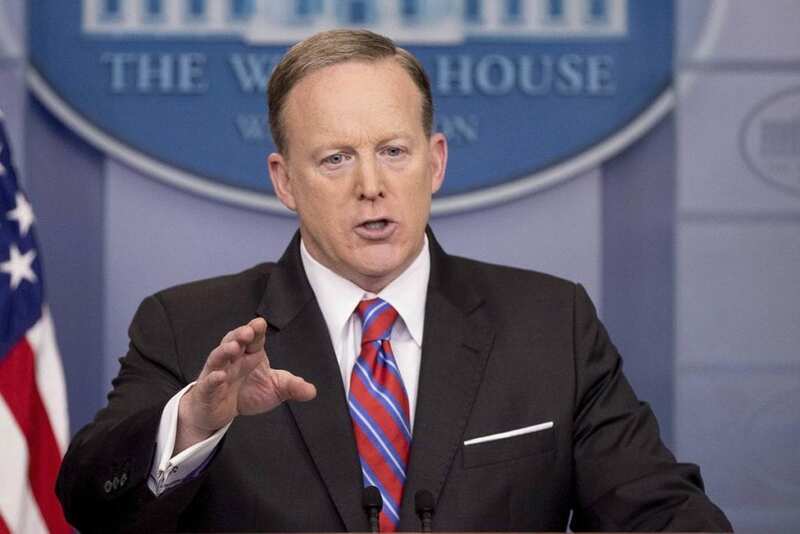 While White House press briefings have always been a place for administrations to spin the press and manipulate coverage to best suit their interests, Spicer would frustrate reporters with bullying attacks, bald-faced lies and obvious misrepresentations of facts. Perhaps his second biggest humiliation after being trotted out to defend Trump’s crowd size came less than two weeks later in defense of Trump’s executive order to ban people from seven predominantly Muslim countries from traveling to the U.S. During his campaign, Trump had promised to ban Muslims from entering the U.S. until he could “figure out what the hell is going on,” and listed the implementation of this “Muslim ban” on his campaign web site. He made these statements despite Trump calling the policy a “ban” just the day before in a tweet. Also, the Muslim ban policy page still stood on the president’s campaign site. In what became his classic style of absurdist aggression, Spicer said Trump’s use of the word “ban” was the media’s fault. Trump was just “using the words that the media is using,” he said. After that, Spicer’s demeaning defenses of the president’s bizarre statement continued unabated. When the president declared, with no evidence, that former President Barack Obama had illegally spied him on using British intelligence, Spicer simply repeated the claim in his daily press briefing. His sourcing? Fox News talking head Andrew Napolitano. After Trump’s national security adviser, Michael Flynn, was pushed out for lying about his contacts with Russian officials, Spicer defended the president by calling Flynn simply a “volunteer” on the president’s campaign. In fact, Flynn was a high-level adviser to the president during his campaign who gave a primetime speech at the Republican National Convention. In that same press briefing, Spicer said that Trump’s former campaign manager Paul Manafort had a “limited role” on the campaign. To defend the president’s falsehoods about voter fraud in the election, Spicer incorrectly cited a 2008 Pew study to say that 14 percent of voters are non-citizens. Even Spicer couldn’t defend every zany tweet sent by the president, who has tweeted nearly 1,000 times since his inauguration. To deal with this, Spicer, hired to be the mouthpiece for the administration, behaved as though he were detached from the president’s utterings. “The tweet speaks for itself” became a common statement from Spicer when he didn’t want to actually defend the president’s statements. Of particular note was when Trump fired FBI director James Comey and then leveled an empty threat to Comey about the existence of possible recordings of their conversations that would undermine his statements. There were no recordings. When Comey was fired, Spicer’s humiliation was extended further as he hid in the bushesin front of the White House to avoid answering questions from reporters. But playing this role was not the only humiliation Spicer suffered. Despite his loyal representation of perhaps one of the most difficult presidents to front for in history, Spicer was not included in the official staff trip to meet Vatican officials during an overseas White House trip. A devout Catholic, he was reported to have high hopes of meeting Pope Francis. Nevertheless, he persisted in his job until he was passed over for Scaramucci. That was one humiliation too far.